Welcome to the Gear Up! Questline! I'm Chris and I'm also one of the guild officers of the Gear Up! Questline. I look forward to hearing from you all and getting to know more about you all as the Teacher Camp progresses. I am an Associate Dean for Career and Technical Education at the community college level and have been utilizing games and game based learning since I was a full time faculty member. I've used game based learning in Accounting, Business, and Statistics. Role playing games like World of Warcraft and many other games have robust mathematical and statistical infrastructure that manage things like loot drops, being able to hit an enemy, how much damage or healing you do, etc. Most players are unaware of all that goes into the mechanics of the game until they reach the end game. As the Guild Master for Inevitable Betrayal, it has been a lot of fun setting up the various outpost guilds and developing this questline to really focus on the mathematical and statistical framework that exist in World of Warcraft and are used by players everyday. Once you are in game, my toon's name is Terroir. So feel free to look me up and chat in game. Please let either Kae or myself know if you have any questions during your quests. I'm also very excited about the opportunity of introducing more educators to World of Warcraft, which really has become a third place. This virtual space is where our guildees meet, socialize, collaborate on projects, and pursue various aspects of the game and its implications and applications to K-20 education. I look forward to seeing you all online. I'm Kae and I'll be one of the guild officers with you in the Math & Stats questline for December. I’m also a guild and raid officer in an educator’s guild known as Inevitable Betrayal. For my guild, I'm the keeper of the collective stats. What does this mean? Well, I keep a spreadsheet of the item level of all raid eligible players in my guild. I can predict based on historical data what a player will do with DPS (damage per second) or healing. It informs the choices the raid officers make when choosing which raid to do and which players to bring. 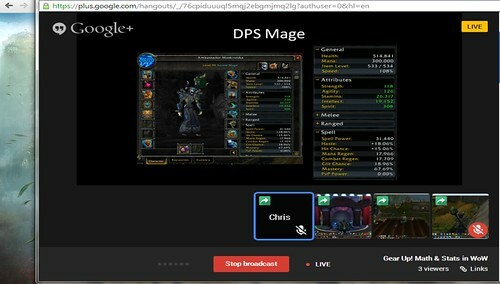 I also keep an eye on and update progress on realm reporting sites like WoW Heroes. It's not quite Moneyball but it is fun! Hi I'm Kasper from Denmark. I'm a 7th, 8th and 9th level math teacher, besides I also teach physics and chemistry and PE. I've done a single test-run of math-lessons in wow - other than that, I've only played very little MMORPG. The top dog is a level 20 character in wow on the free version. I'm here to find ways to implement wow in my math classes, not to level in wow. I've looked through a few of the videos, but until now - there a a lot of info about add-ons and guilds, and a bit too little concrete examples of how to implement (for my taste).. The most helpfull information for now was the wowinschools site.. Looking forward to more examples..
Great to have you here! So sorry to hear that our questline is not to your taste. It really may be a difference in taste or style. The way we have implemented World of Warcraft in classes has been to have the students play the game and use leveling as a way to teach statistics and math. It is an embedded approach which does involve the students playing in a guild with their classmates. Everything they do, creating a character, deciding on gear, choosing which quest based on points, gear and gold, making decision on guild activities for us has been a math or statistics problem. We have found it easy for us to align these activities to the Common Core State Standards http://www.corestandards.org/Math/Content/HSS/introduction and also the Colorado Common Core System to gameplay such as leveling. I agree that WoW in School http://wowinschool.pbworks.com/w/page/5268736/Math%20Lessons is an excellent resource. It may be exactly what you need in your classroom. Most examples we will be using are for characters above level 20. We hope that even if our methodology and the character levels are different than yours, that you will be able to learn something useful to apply to your classroom. Thank you for taking our questline. Thanks for letting us know what your focus is on. While most of our content will be on the end game (level 90 activities), a lot can be pulled down to a lower level character, although there would be some level of abstraction with it. Even at level 20, you can still optimize your character by looking at the priority stats, cool down, etc. Also the statistical modeling of loot drops, crit, and other factors will still apply. We'll definitely keep you in mind as we move forward on the hangout sessions and try to slip in a few examples that might be closer to what you are looking for. Could you give us an example of some of the types of math you are teaching in 7th, 8th and 9th grade or better yet, concepts that you are looking to apply gamification to? That would really help us as we design the next few synchronous sessions.